Home Allotment A Successful Risk! When I got my allotment I knew straight away that I wanted to grow crops that I like to eat or eat a lot of. There’s no point growing things you don’t like eating after all! It would be nice to be self sufficient with vegetables but I know that this is a long stretch due to the allotments being so tiny. One of the things we eat a lot of however, are potatoes, we have them with near enough every meal so it was one of the main crops that I wanted to grow. As you all know my Dad has an allotment too, so we came to the conclusion that I could grow the earlies and he would grow the main potatoes. This way it would just be easier to manage and make life a little simpler. 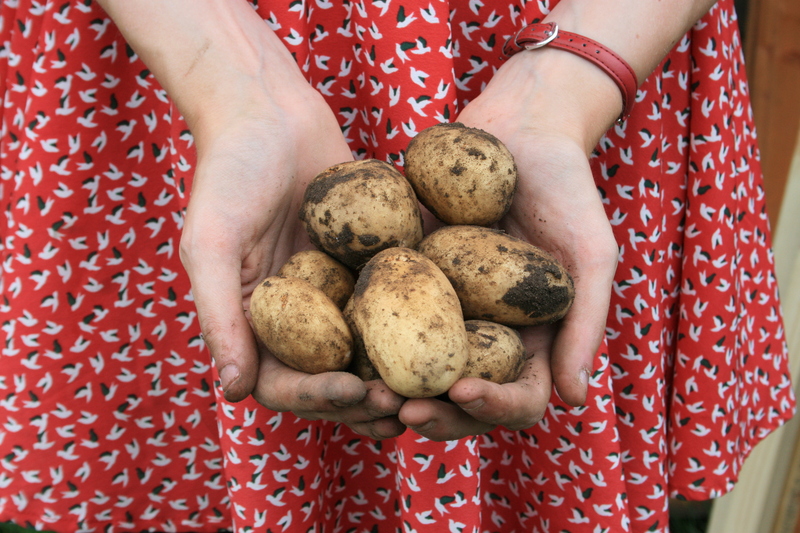 I chose to grow 2 rows of Maris Peer second early potatoes as well as 3 rows of International Kidney salad potatoes. Now I’ve heard of people growing Maris Peer potatoes successfully but no news or tips for the International Kidneys. These are formerly known as Jersey Royals but obviously they can’t be called that if they aren’t grow in jersey so we shall call them Southampton Royals! It was a little bit of a risk choosing that variety of potato to grow because I had never known anyone who has grown them (and one garden centre told me to steer clear of that variety) But the risk paid off completely. I planted the International Kidney seed potatoes back on the 11th of March, they never flowered but after carefully scooping back some of the soil I saw a glimpse of a large jersey royal! We made plans to have them for dinner the next night so I dug up 3 plants which was more then enough to feed four adults. I was a little bit disappointed about the yield, there was only 4 or 5 potatoes per plant which I didn’t think was a lot really. I also think that I might have left them a tad too long in the ground, they were rather large for salad potatoes but they were delicious none the less. We cooked them with a little fresh mint and served them with butter, homegrown is most definitely the best! Hi, I love watching your videos and find them a real inspiration. I want a pond now! This is my first year on my allotment so it’s good to be able to follow you. Will have to try digging up my earlies.